In this episode, we talk about the world of pregnancy, breastfeeding, and marijuana use. To help make sense of this topic – and sort the science from the pearl-clutching – I brought in a special guest: Heather Thompson, PhD. Heather not only discusses the research, but helps make it relevant to worried moms and birth workers. First, a note about the relevance of most drug research. As a whole, drugs are not tested on pregnant women to see how they respond. Most drugs are tested on a “control” generally made up of white men, so those data can only ever represent the population of white men – we cannot always extrapolate drug effects onto other groups. The female metabolism, especially during pregnancy, differs greatly. What are the benefits of marijuana use during pregnancy/post-partum? During pregnancy, it is often used for morning sickness and extreme nausea (hyperemesis gravidarum), as well as migraines, pain, cancer, and other pre-existing health issues. Research indicates that about 2 to 4% of pregnant women in the U.S. use marijuana. It’s important to remember that for people using marijuana as medicine–for example, to relieve nausea that is preventing intake of much-needed nutrition–there is an exchange of risks and benefits. Use of marijuana is not only about risk, but about benefit, and those risks and benefits must be weighed against the alternatives. It may be more acceptable to one mother to manage severe anxiety with careful, calculated use of marijuana instead of exposing the developing fetus to prescription drugs with known risks, or in lieu of stopping anxiety medications altogether during pregnancy. 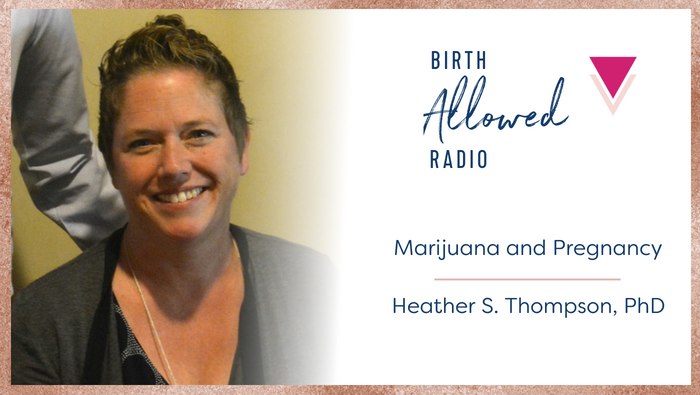 There are three primary longitudinal studies on perinatal marijuana use, which report that the main potential adverse newborn outcomes associated with prenatal cannabis use are pre-term birth, low birth weight, and increased NICU admissions. It is important to note that marijuana alone does not cause lower birth weight or pre-term birth, especially with moderate use. Separating out the effects of other factors, like tobacco smoking and poverty, is challenging but critical to understanding the independent effects of marijuana use. We have been studying marijuana for quite a long time from the perspective of looking for harm, but we haven’t shown that harm definitively. One of the primary authors on the Canadian longitudinal study, Dr. Peter Fried, says that despite decades of research, it has been found that the harms to babies are small, resolved in a few weeks or months, and that the child’s environment plays a larger role in development than marijuana itself. Language matters. “Harm” has punitive connotations. “Expected outcomes” helps parents make reasoned decisions and brings less loaded language into the conversation. What birth workers need to know. Investigate your state’s mandatory reporting laws. Remember that you can add narrative to reports made to Child Protective Services; nurses’ commentary about patients holds a lot of weight. Any time you feel you must act as a mandatory reporter, keep in mind that use does not equal abuse. Prenatal providers need to help clients understand both the health and the legal risks (such as investigation by child welfare services) for a complete risk/benefit analysis.